Imagine you crash-landed on an unknown planet, a completely different world. Amnesia has stolen your memories, you don't know where you are, you don't know who you are, and your only companion is a talking drone: Welcome to EDEN TOMORROW! EDEN TOMORROW catapults the player directly in the middle of a strange cosmos: frightening creatures, cryptic riddles and abandoned worlds. It is an epic odyssey through a fascinating new world, and the question "What has happened here?“ is always present. The player experiences all threats as close as possible in first person perspective and is completely drawn into the game world. Whether eye to eye with giant worms, pursued by attacking flying creatures or right in the middle of a herd of giant Sand Walkers, the player should always keep his eyes open! The main characters of EDEN TOMORROW are the playable duo of the amnesia plagued human and a drone, which named itself Newton, both with different powers and skills. They have to work together to survive in a foreign — most of the time very hostile and dangerous — world. Newton plays a central role in EDEN Tomorrow. He provides useful hints, is a fearless fighter for the common cause and is blessed with a pinch of black humor. In the course of the game the player gets more and more indications as to what might have happened to Human, Newton and this world. 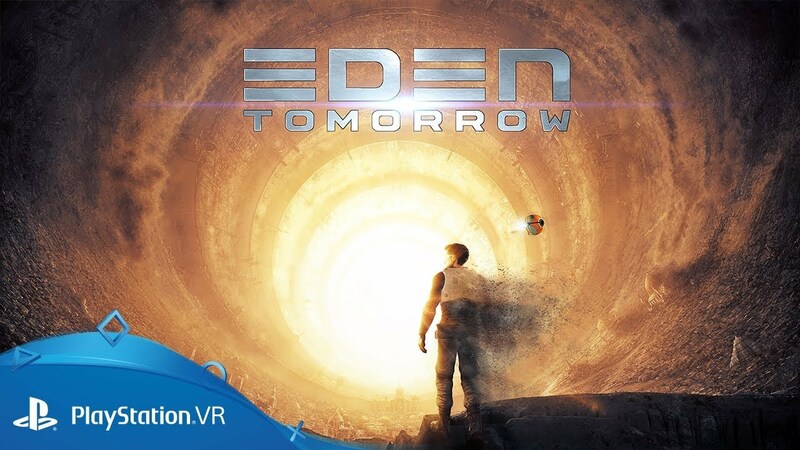 Eden-Tomorrow for PlayStation VR. The odyssey starts on February 12th 2019. Free Demo out now.